To carry out the mission and high standards set forth by the TLBAA, the Association established a strong youth organization to train young breeders to become future Texas Longhorn advocates. 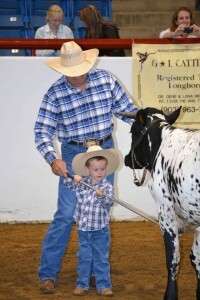 In 1983, the Texas Longhorn Breeders of Tomorrow (TLBT) was organized, and the first youth show was held. Membership numbered about 25 young people then and today boasts 14 affiliate groups with over 450 members from across the United States, Canada and Worldwide. Ages range from newborns to 18. As these girls and boys transitioned into adulthood, they became established breeders of Texas Longhorn cattle. Others, whose careers take different paths, credit the TLBT with teaching them discipline, perseverance, patience, successful relationships and the ability to set and reach goals.